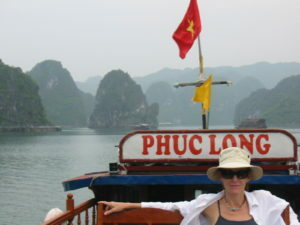 Halong Bay, I traveled here some years ago on a trip to Northern Vietnam with my husband. 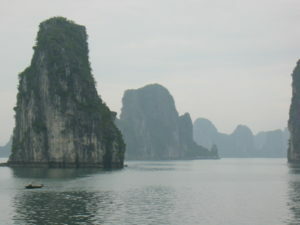 It was listed in the guidebook: Things You Must See in Northern Vietnam. We crawled into a car with our guide before dawn for the four-hour drive from Hanoi, including one bathroom stop. 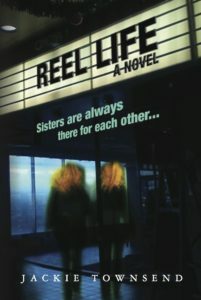 I felt drugged by the time we arrived—hot, sticky, humid, the bay a blurry haze. Throngs of tourists poured off buses. Guides haggled furiously for boats. We’d paid extra for a private boat, a “junk” boat they literally called it, because that’s what it looked like, a piece of junk floating on the water. Petrol fumes wafted in our wake as we puttered off into the layers of placid grey, the soft outline of a jutting archipelago. As we moved out further into the water, in a direction away from the other tourist boats, very soon we came to be alone and the world around us began to crystalize. The silvery water turned into the purest of jades, the rocks, massive and towering, burst up as if from the center of the earth, verdant, luscious, full of life. My husband and I climbed to the upper deck and took seats in two hard-backed chairs that resembled thrones. Awed and wordless is how we sat for hours while our boat snaked through the towering creatures (made from the fire of dragons, so the myth goes), their shadows moving as if through us in a silence that had become profound. 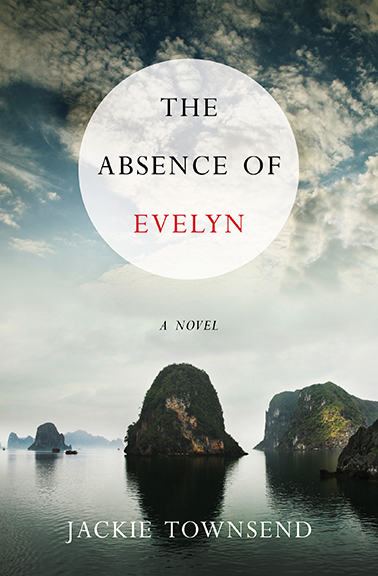 The Absence of Evelyn is a book about love, filial and amorous, healing and destructive, and while I had the luxury of choosing from an array of wonderful cover options thanks to the talented artists at Spark Press, covers which often depicted women, young-adult women, middle-aged women, ageless women, their obscure, shadowed faces, or no faces at all as they looked off into distant waters, there was something about this cover with the absent woman on it that struck me. Its mystical quality, the elusive nature of the love that we all, whether we’re willing to admit it or not, search the ends of the earth for. Posted on September 29th, 2016 You can leave a response, or trackback from your own site.